The â€œrule of thirdsâ€� is a guideline that can help you create interesting photographs when youâ€™re the photographer or to create a more compelling composition if youâ€™re using someone elseâ€™s picture in your design. The rule is one of the most fundamental in creating appealing compositions in photography, art and design. The main concept behind the rule of thirds is to imagine two horizontal lines and two vertical lines breaking an image into thirds so that you have 9 parts, as shown below. Generally (and remember all rules are made to be broken, but most of the time), you can achieve more appealing compositions if you position a focal point or subject at one of the â€œthirdsâ€� where the horizontal and vertical lines meet. If youâ€™re taking the photograph yourself, you need to imagine the horizontal and vertical lines as you look through the viewfinder. Youâ€™ll find that many of your shots will become more compelling when you keep this rule in mind. If the photograph has already been taken, you can crop the image using the rule of thirds before sending it for print or adding it to your design. Iâ€™ll show you how to do it in Photoshop using a little trick with gridlines, but the concept is the same with any image editing software that allows you to use gridlines or guidelines. 1. 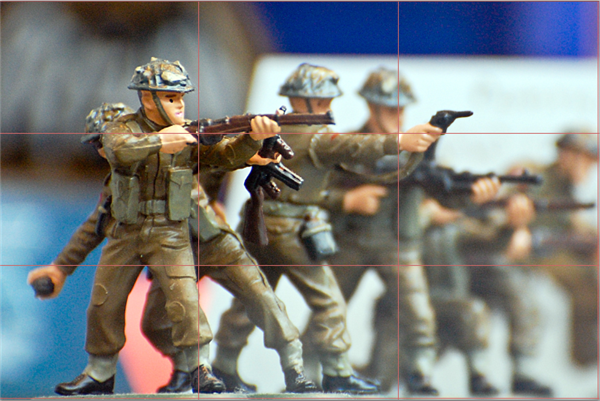 Open up the image you want to apply the rule of thirds to. Weâ€™re going to crop our original image in order to improve it. Obviously cropping makes the image smaller so thatâ€™s a little bit of a downside. 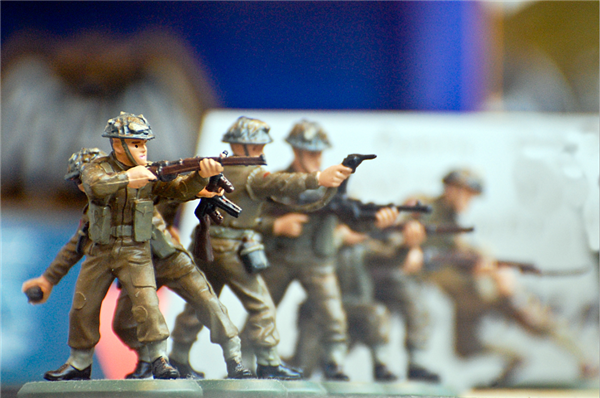 Below you can see a photograph of some toy soldiers. I took this in the window of a toy shop and Iâ€™d like to get rid of some of the messy background and have more of a focus on the soldier on the left hand side. 2. My original photograph had dimensions of 30 x 20 cm with a resolution of 240 ppi. If youâ€™re not sure how to find out this information, just click Image > Image Size and the Image size dialog box opens, displaying your image info. Create a new document that is a bit smaller than your original photograph but make sure that you are using the same color mode and resolution. I set my new document size to be 24cm x 16cm. With your new document active choose Edit > Preferences (PC) or Preferences (Mac) and choose Guides, Grid & Slices. A dialog box opens giving you options for setting up how your guides and gridlines will look. Note: The screen grab below is from CS4, there are slight differences in previous versions of Photoshop but the option weâ€™re interested in is the same in all CS versions. 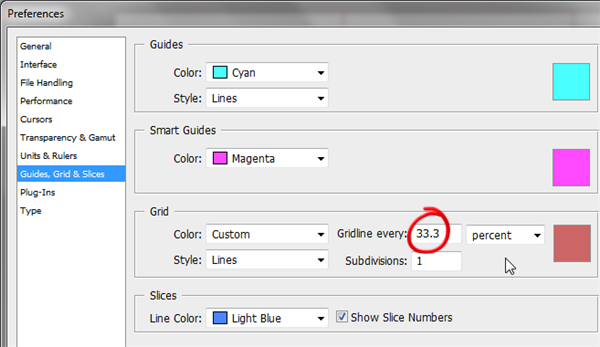 Set the â€œGridline everyâ€� option to 33.3 percent and â€œSubdivisionsâ€� to 1. You can change the color of the lines by clicking on the square color swatch on the right if you want. Click OK.
4. In order to see the preferences youâ€™ve just set, choose View > Show > Grid. 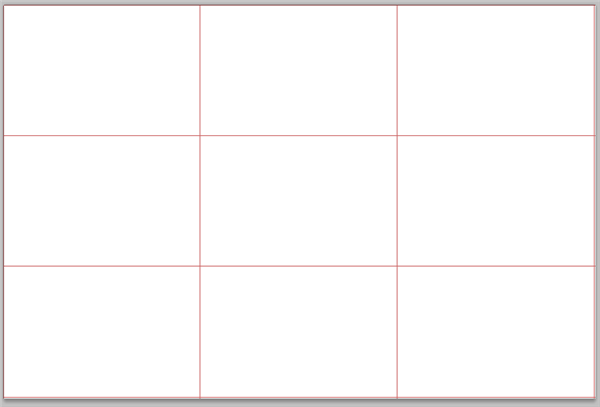 Once you do that, the non-printing grid will appear on your document. This is what youâ€™ll use as a visual aid to cropping. 5. Go back to your original document. Press Ctrl + A / Cmd + A to select the whole image. Press Ctrl + C / Cmd + C to copy the selection, then return to your new blank document. Press Ctrl + V / Cmd + V to paste the image in. Select the Move tool (V) and drag the image so that the focal point falls onto one of the intersecting points. In this case Iâ€™ve dragged the image so that the focal point is around the little soldierâ€™s finger on the trigger at the top left intersection. 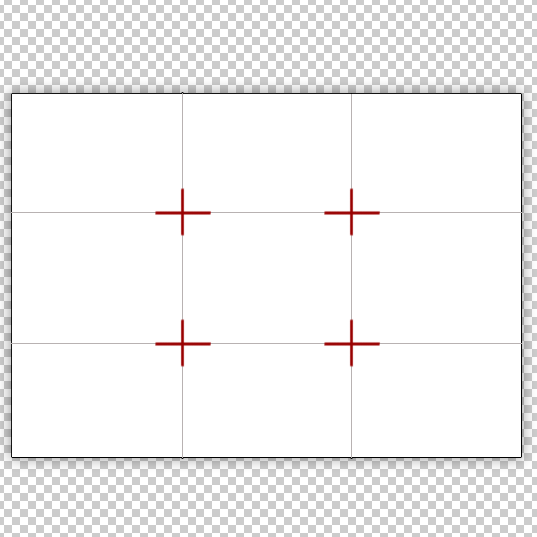 You should now have a nicely cropped, visually more appealing image thanks to the rule of thirds.